Find hotel near Bali Luwak Coffee Plantat .. Walk through the Bali Coffee Plantations to witness the creation of the most expensive coffee in the world, the Kopi Luwak. The unique process of cultivating the coffee may leave some squeamish - the coffee beans are passed through the digestive tract of the Indonesian Civet cat, and then cultured to produce the smoothest, creamiest and flavorful coffee. The process of consumption and digestion by the cat transforms the acids in coffee beans, making the flavour truly one of a kind. A rare, and expensive commodity, experience the Kopi Lewak making as you walk along the scenic expanse of coffee plantations. Also, try other kinds of local coffees, including blends of robusta and arabica coffees. For those not interested in coffee, there is plenty of intriguing vegetation, panoramic views of the plantation and the serenity of the natural surroundings which are big attractions to visit this spot. How popular is Bali Luwak Coffee Plantation? People normally club together Water Sport Tanjung Benoa Bali Promo and Ayung River Rafting while planning their visit to Bali Luwak Coffee Plantation. This was my favorite part of the trip to Ubud, the tour guide was knowledgeable and very friendly. Learning the processes for the coffee from start to finish was interesting and there are tons of great photo ops. 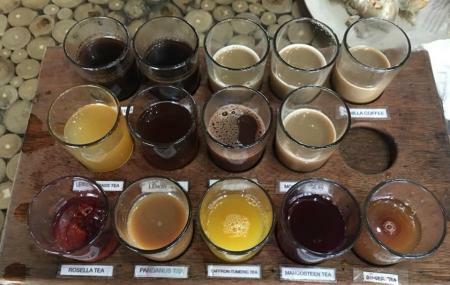 Your tour includes samples of coffees a and teas enjoyed at the mountain top Cafe. Awesome place to visit and learn about the culture. True, that the animals could be treated better. Except for that a nice informative trip and a good coffee/tea tasting. It costs around 50.000 rupiah. I was happy with my tour. DO NOT COME HERE. I wasted 1 hour on my motorbike thinking this was the plantation due to the other review on google but JUST like the name suggests it really is an office. Dont waste your time. Came here as a recommendation of a family member but didn’t expect to see so many animals in cages, it was quite upsetting to see. If they’re going to be used to make money they should have a more comfortable place to live. The coffee wasn’t for us either, maybe were just not used to the taste of something different.